Discover Seattle's popular downtown attractions and area neighborhoods on this private, 4-hour city tour. Dine in one of Seattle's great restaurants and learn the local and regional history in this vibrant and growing city, including the geology and current Northwest trends. See the iconic Space Needle, Ballard Locks, Historic Pioneer Square, Pike Place Market, the Fremont and Magnolia neighborhoods, plus incredible views of Puget Sound, and more. This 4-hour tour begins when we pick you up at your hotel or b&b and is customized as we go to meet your specific interests. Our driver guides are very knowledgeable about the smallest details in Seattle. No matter the route, the guide will surprise you with secrets of Seattle and hidden gems. Visit Gasworks Park for a fantastic view across Lake Union. The park itself is on the National Register of Historic Places. Then travel through quirky Fremont, with loads of unique art, like a missile/rocket and the famous Fremont Troll. After seeing Fishermen's Terminal, head to Ballard Locks to explore the dam, the glass-wall fish ladder, and watch as boats drift through the locks. There are also a plethora of Great Blue Herons in this area. After seeing the viewpoint of Puget Sound from Magnolia Bluff, check out the iconic Space Needle. Then head to Historic Pioneer Square and learn about the beginnings of the United Parcel Service. See Waterfall Park, visit a glass-blowing studio, and learn about Seattle's early history in a grand, 1890 setting. 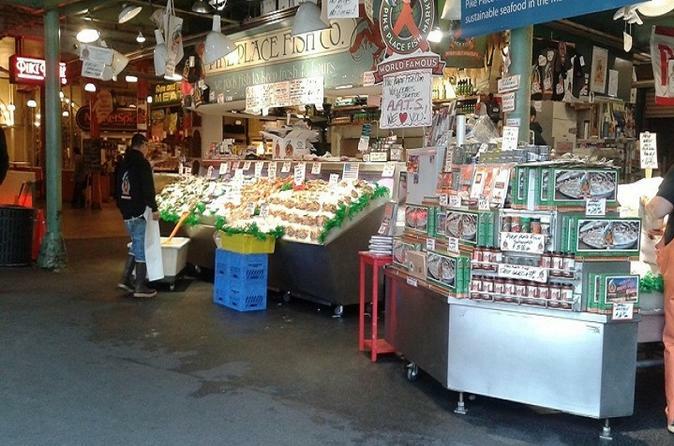 Finally, stop at another of Seattle's iconic locations: Pike Place Market. Feel free to end the tour here to share the foods, fragrances, and history of this remarkable farmers market, or be taken back to your hotel.